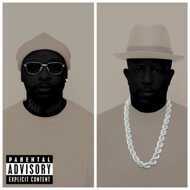 PRhyme 2 is the second official full-length collaboration from two of HipHop’s most respected artists. PRhyme marks the first time that DJ Premier has been part of a group since being ½ of the legendary Gang Starr. The PRhyme 2 album exclusively samples the work of composer and producer AntMan Wonder, produced by the legendary DJ Premier. Featuring Dave East, Yelawolf, CeeLo Green, 2 Chainz, Big K.R.I.T., Curren$y, and Rapsody.